← Between what is said and done… corruption is present under current Bolivian government! The drivers of public transport yesterday [01/11/2016] staged riots in the vicinity of the Simon Bolivar Avenue, near Hernando Siles Stadium, when they tried to force drivers to charge fares with an increase of Bs0.50 and the Municipal Guard asked passengers not to alter the rate established. The arrogant and intransigent attitude of the drivers was reproached for citizenship. In recent days, some leaders or transport members were given the task of hitting bystanders, including a woman was beaten, another citizen was attacked in front of his young daughter, when he asked to depose that attitude, plus a senior person was also victims of attacks, only to demand good service. They also stated that the carriers fail to meet their commitments, regardless of mistreating the passengers, they are violating traffic rules and continue with the usual trameajes [only provide service to portions of their route] and still require increased fares. Bolivia needs to restore order and stop anarchy! Current government’s only priority is to seize power indefinitely and because of that does not enforce the law. 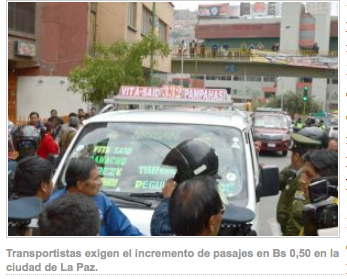 Now we see one of the worst monopolies in Bolivia hitting citizens and nor complying with the law. It is outrageous that violence reigns in our streets, this government as a true ochlocrat does nothing to protect the citizens! This entry was posted in Bolivia, Business, Crime and Violence, Economics, La Paz, Politics, Social Unrest and tagged anarchy, democracy in peril, monopoly, Ochlocracy, public transport, violence. Bookmark the permalink.